One of the most high-pressure tasks in frontline public-sector comms falls to the team at NHS England. PRWeek gets under the skin of the service and its constant battle to get health in the headlines. Pressure on hospital A&E departments, staff shortages and the dangers of flu – the NHS is in the midst of an annual 'winter crisis' that last year led to more than 50,000 extra deaths, according to official statistics. Every media outlet focuses on the additional strain on the NHS during December, January and February, while Brexit has thrown a large measure of anxiety into the mix. The challenge for NHS England’s comms team is immense – balancing dozens of daily media calls with proactively sharing its winter messaging and working closely with comms professionals in local and regional trusts to maintain the relationship with the public. Simon Enright, director of communications, says fundamental to the task is to "reinvigorate the relationship we have with the public". He leads the 30-strong national comms team at NHS England, the body that shares out £100bn of annual NHS funding, commissions healthcare services and sets the priorities of the NHS. In NHS England’s imposing red brick and glass building in South London, Enright works closely with head of media, James Lyons, and head of public affairs, Alaina Macdonald, to manage the demands of a crisis-hungry media alongside communicating with politicians, the public and NHS staff. "If you employ 1.3 million people and look after a million patients each day, every one of those interactions isn’t going to be perfect," points out Enright, who joined NHS England in 2013 after 16 years working at the BBC. "It’s so much easier to recognise when things go wrong than the many times they go right. 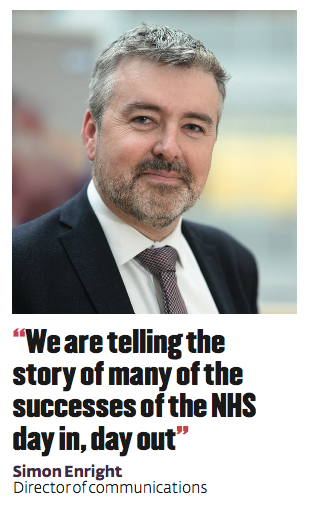 "But one core thing the team does is make sure in every part of the country, in every different stakeholder group, with the media, in our publications, on social media, that we are telling the story of many of the successes of the NHS day in, day out." Under the media microscope on NHS winter coping strategies, NHS England’s comms team is working to share five key messages through its ‘Help us help you’ campaign, which was developed to replace the previous ‘Stay well this winter’ activity. The idea is to "help the NHS with the pressures it has around winter", says Enright, by encouraging behaviour change and sharing information about services that can reduce the pressure on A&E departments. First is to promote take-up of the flu jab, while another message is directed at over-65s and those with long-term health conditions, to visit their pharmacist as soon as they get ill with respiratory problems that might worsen in the cold or snow. NHS England also wants people to use the NHS 111 phone line service, and is sharing the message that GPs have extended opening hours, from 8am to 8pm and at weekends, while promoting the clinical knowledge of pharmacists. Enright says there has been cut-through: analysis shows almost half of people now have a greater understanding of what a pharmacist can offer, compared to less than a third of patients in 2016/17. Winter aside, 2018 was a year of opportunity for NHS England, as the health service celebrated the 70th anniversary of its inception. "Every national newspaper, and every regional and local newspaper that we monitor, carried a positive story about the NHS during the 70th year," says Enright. With the NHS having the dubious accolade of being the second-most written-about subject in Conservative politicians’ post bags, and the third- most popular for people writing to Labour politicians, the chance to shout about its history, contribution and future was a golden opportunity for comms. Healthcare comms veteran Antony Tiernan took on the role of director of engagement and comms for NHS70, and his leadership was an "essential ingredient in terms of getting people excited about it", according to Enright. The anniversary galvanised support for the NHS as a pillar of national pride, he says, with media outlets including the Daily Mail, Yorkshire Post, The One Show, ITV, Daily Mirror and The Sun all running campaigns to celebrate the staff of the health service. As well as commemorating the birthday, target- driven goals included a recruitment drive using the message ‘We are the NHS’, which has been supported by activity including social-media videos and webinars for schools. "Two years out from the anniversary we wanted to make sure the public were committed to the NHS and really valued staff," explains Enright. The results of that campaign can be measured in the 100,000 searches each month for a nursing career, he adds – a full evaluation is due to be completed this month (January). Part of the celebratory year included a government ‘birthday present’ of funding, which will amount to an extra £20.5bn by 2023. The major challenge now is to share with government, stakeholders and the public just how that will be spent most effectively. Enter the NHS long-term plan. Due to be published as PRWeek went to press, the plan’s development has, in itself, been a monumental comms exercise. Some 3.5 million members of the public have shared their views, with a total of 14 working groups having input into the plan’s themes, which include cancer, stroke, and mental health. More than 200 live events gathered input from harder-to-reach groups, such as homeless people and travelling communities, as well as collaborating with politicians and healthcare professionals to ensure thorough consultation that reached and heard the views of all those affected by the plan. Head of public affairs Alaina Macdonald, who joined in 2014 and leads a team of five, says: "We had quite a challenging summer, trying to do as much diverse engagement as possible to get the plan in the best shape it could be. Everyone uses the NHS, so that’s really important." An online portal allowed the public to submit their views, while partnerships with patient associations and other stakeholders helped to reach further groups. "This is currently quite a high-level plan, but [over] the next six months we will continue the engagement, working with communities to share what this will mean in their local area," she adds. Against the backdrop of the long-term plan, the NHS’ role as a healthcare innovator is another strand of work for the comms function. 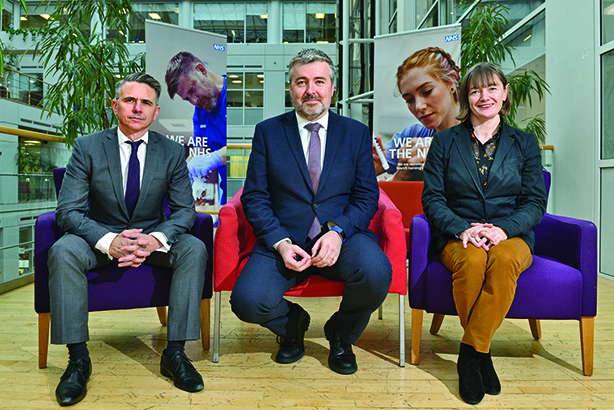 The 12-strong media team gets "dozens of enquiries every day, from the Local Government Chronicle to Hugh Pym, the BBC’s health editor", says head of media James Lyons, who joined NHS England in early 2017 after 24 years as a journalist. "We are a 24/7 operation and it takes a lot of time and effort dealing with the enquiries," adds. "I wanted to do a better job of getting proactive stories out there. That has been a success but it is a constant challenge to free up resource." The recent announcement that children in the UK with leukaemia will be the first in Europe to have access to a groundbreaking immunotherapy treatment called CAR-T is an example of a ‘good news story’, says Lyons, who highlights the importance of links with the NHS England policy team to share the latest, often highly technical, news. About six members of the comms team are dedicated to the NHS England website and social media, while another six focus on marketing – a discipline Enright points out is now integral to the comms strategy. Most comms work is carried out in-house, but NHS England has worked with agencies including 23Red and Freuds, as well as using creative agencies Mullen Lowe and M&C Saatchi for its major campaigns on NHS70 and winter health. Innovations for the future include the NHS app – due to be launched this month (January) – and the possibility of using the Wi-Fi sign-in screen across the NHS estate to share key messages with patients and staff. A new Facebook contract means that, for the first time, this winter NHS England will be able to send location-targeted posts in areas especially under pressure, with the aim of helping direct patients to the correct service if they are ill.
"We think social media could be even stronger as a way of helping us," reveals Enright, as NHS England has 250,000 followers on Twitter and 65,000 on Facebook. As the comms leaders head back into the lion’s den, Enright concludes: "Our core brand is: ‘People who care’. This is not about any one individual – it is about a team." Simon Enright is a speaker at PharmaComms 2019, a new two-day conference from PRWeek, taking place on 13-14 February, bringing together marketing and comms leaders from across industry, government and trade bodies to address the specific challenges and opportunities set to transform pharmaceutical communications.